Five miles separate Clay and John Adams high schools in South Bend. 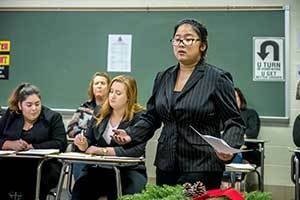 But when it comes to mock trial, the two public high schools, both part of the South Bend Community School Corp., have been worlds apart for most of the past two decades. Adams, an international baccalaureate magnet school, has won 18 state championships and two national championships in 18 years. Clay, a visual and performing arts magnet school, has never advanced past regionals, and until last year, went three years without a win at any level of competition. Thanks, in part, to head coach Henry Leaman, a second-year Law School student at the University of Notre Dame, Clay went 2-4 in regional competition last year and nearly advanced to state for the first time in school history. This despite a shorthanded coaching staff composed of Leaman, the only full-time coach with any legal experience; two local attorneys; a faculty sponsor with no legal experience; and a Notre Dame undergraduate with mock trial experience. “We went into the final round with our destiny in our hands,” said Leaman, a native of St. Charles, Illinois, outside Chicago. “If we had split the round, we would have gone to state. We lost by minus-2 points on each ballot. Hoping to build on that success, Leaman recruited five additional Law School students, including first-year student Paris Mayfield, of suburban Dallas, Texas, as assistant coaches this offseason. It’s a welcome change for Clay, which had no Law School students on board just three years ago and which is only beginning to establish long-term relationships with the local legal community — unlike Adams, whose list of current and former coaches includes local judges and attorneys with ties to the Law School as well as students, faculty and staff from the Law School itself. Not coincidentally, expectations are high this year ahead of regionals later this month and the annual state competition in March. “I think we have a great chance to get to state, and that’s my hope,” said Dianna Christopher, an English teacher at Clay and the team’s longtime faculty sponsor. If so, Christopher said, the Law School students deserve credit. “They’ve been phenomenal,” she said. As practiced at the high school level, mock trial is an academic competition in which students participate in a simulated trial in order to learn about the legal system and develop valuable skills in the areas of leadership, public speaking, rhetoric and persuasion. In Indiana, the State Bar Association hosts the state competition each year. The foundation releases case materials, including complaints and responses, witness lists and statements and jury instructions, in the fall. Regional competition takes place in February. State competition takes place in March. In preparation for this year’s competition, Clay’s varsity and junior varsity squads faced off in an early scrimmage in November. Packed into a windowless classroom at Clay, the students acted as lawyers, prosecutors and witnesses in a fictional case involving a high school band director accused of endangering a student by making the student run outside in the heat as punishment for showing up late to practice. The student, “Addison Cowell,” later collapsed from heat exhaustion, even as the rest of the band retreated inside, according to school policy, because of the dangerously hot and humid conditions. In a sworn statement before the trial, the director, “Marion Roberts,” described Cowell as consistently tardy and otherwise difficult as lead trumpet. “Have you had problems with other students?” Roberts’ attorney, dressed in a black skirt and sweater, a black-and-white striped top, black nylons and black pumps, asked Roberts during the scrimmage. The scrimmage lasted about two hours. Afterward, the students and coaches hung around in the classroom and adjacent hallway talking about the case before exiting into the cool evening. Veronica Navarro, a senior at Clay and a member of the varsity squad, served as co-counsel for Cowell, the plaintiff. Especially Leaman, said fellow senior Dakota Balding, also a member of the varsity squad. “Henry has just turned our team around,” said Balding, who portrayed Cowell during the scrimmage. 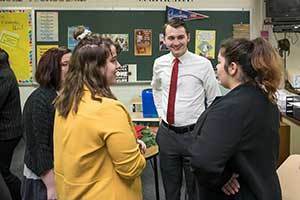 Notre Dame 2L Law Student Henry Leaman talks with members of the Clay High School Mock Trial team during an evening scrimmage at Clay High School. Photo by Matt Cashore/University of Notre Dame. Leaman, who coached his former high school mock trial team during college, and who has helped judge mock trial competitions in the past, gave most of the credit to the students. In particular, he marveled at their mastery of the rules of evidence, which govern the proof of fact in a legal proceeding. For Navarro, who hopes to someday attend law school, possibly at Notre Dame, the Law School students have been valuable personally as well. “They make me feel really comfortable coming to them with questions,” Navarro said. Leaman also invited the students to tour campus and the Law School, and to learn about the law along the way, the weekend of the Notre Dame-Stanford football game in September. But the benefits flow both ways. For the Law School students, the experience is a welcome distraction from the regular routine of Law School, Leaman and Mayfield said, as well as a valuable opportunity to transfer the lessons of the classroom to the (fictional) courtroom. “You spend so long in law school thinking about things that happened decades ago, names on a page, and being with the students helps remind you how arguments come across, how you compose yourself, and just who you are as a lawyer,” Leaman said. It also provides an opportunity for the Law School students to venture off campus and into the community — “We barely get out to eat in South Bend, let alone interact with people,” Mayfield said, citing the all-consuming nature of law school — and to pay forward past investments. Originally published by Erin Blasko at news.nd.edu on February 18, 2019.